Stewart made no secret of his intention to protect more of the Tulare County mountain lands. But the next move in this direction, which occurred within a week of the signing of the act he had worked to create, came as a total surprise to Stewart and almost everyone else in Tulare County. On October 1, 1890, President Harrison signed another national park bill that had been introduced by Vandever. This one had been introduced in the House on March 18 as H.R. 8350, to create a Yosemite National Park to surround the existing state reservations which protected Yosemite Valley and the Mariposa Grove of Big Trees. The bill, supported by a group of northern Californians almost totally separate from Stewart's group, had moved slowly, and not until September 30, near the end of the session, did it come before the entire House. As was the case with the Sequoia bill, Representative Payson of the House Committee on Public Lands represented the bill on the floor of the House. Paysons recommendation, however, was not that the House pass H. R 8350, but rather that the House agree instead to consider a substitute bill, H.R. 12187, also sponsored by Vandever. The substitute differed radically from Vandever's original bill. It still contained provisions for a Yosemite National Park, but would create a reservation five times larger than that called for in H. R. 8350. 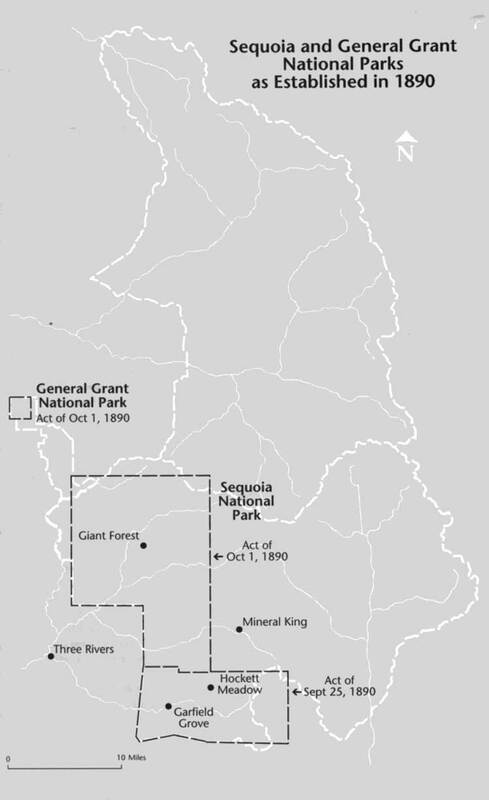 Vandever's original Yosemite scheme outlined a relatively small federal reservation surrounding the state park; the new bill called for an extensive federal park very similar to that proposed the previous year by John Muir. The substitute bill also contained an entirely new section, which would add five townships to Sequoia National Park as well as permanently preserve the four sections of land surrounding the Grant Grove that had first been withdrawn from sale nearly a decade earlier. Within the five townships proposed for addition to Sequoia were all the Timber and Stone Act claims of the Kaweah colonists. As historian Douglas Strong later noted, there is little evidence that the congressmen who passed H. R. 12187 understood what they were doing. The Yosemite portions of the bill were relatively clear, but section three, which affected the Tulare County mountains, was a model of evasion. The lands in question were to be "reserved and withdrawn from settlement, occupancy, or sale under the laws of the United States, and . . . set apart as reserved forest lands . . ." subject to the same management provisions as were included within the Yosemite Park section of the bill. Nowhere was there any mention of H. R. 11570, passed a week earlier, or Sequoia National Park, Tulare County, or even the Kaweah watershed. The full story of how Sequoia National Park came to include the Giant Forest, how General Grant National Park came into existence, and how Yosemite National Park blossomed to include much of the central Sierra, will probably never be known. What is obvious is that through the use of a cooperative congressman who undertook to sponsor several local causes, and then through the very careful and quiet substitution of carefully thought out alternative legislation, some unknown agents created or enlarged three national parks for reasons that can only be surmised. probably the agent was the Southern Pacific Railroad, representing its own interests and possibly also those of some of its individual local representatives, presumably the motivation was nothing less than corporate greedan irony seldom appreciated by modern students of the Sierran national parks.